This Collectible Set Of Toy Glass Mega-Marbles Includes 24 Matching Game Pieces (Player Marbles) And A Matching Shooter. All Are Neatly Packaged In A Mesh Net And Capped Off With An Instruction Card That Explains The Game Of Marbles. The Inside Of The Instruction Card Is Filled With Fun Facts Relating To The Endangered Species Theme Of The Set. Start And Expand Your Collection Player Marbles Measure Approximately 58 Inch (16 Mm). 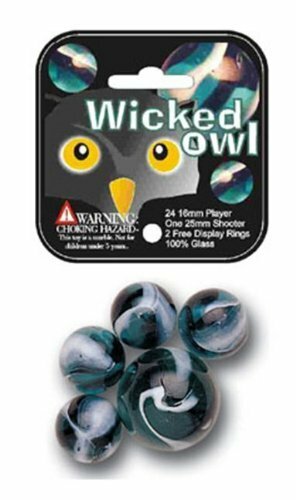 Shooter Marble Measures Approximately 1 Inch (25 Mm). InstructionFact Card Measures Approximately 2.75 X 2.75 Inches (70 Mm). The Snow Leopard Game Net Set Features 24 Player Marbles Crafted Of Textured, Iridescent Cream Colored With Gold Speckled Glass In The Endangered Snow Leopard Glass Pattern. Set Features A Matching Shooter And Is Complete With Gaming Instructions And Fun Facts. This Collectors Set Will Make Playing The Classic Game Of Marbles A Big Cat Of A Good Time.